New Records for Malay Endurance! 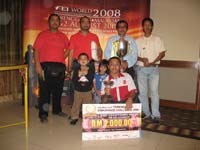 Nik Sabarudin Bin Daud, riding the stallion AS Shiffa Kassan finished first in the 2006 Sultan's Cup 160km CEI*** event in Malaysia! AS Shiffa Kassan was also awarded Best Condition in a race which started at 5pm on Saturday, finishing Sunday Morning with a ride time of 12:38:43! International Certificate of Capability were obtained by the first three finishers of the 160km event. Paul Jeffrey of New Zealand, riding Jakim Zane finished first in the 80km event in a ride time of 5:32:35. Jakim Zane also received the Best Condition award in the 80km event. This ride time established a new Malaysian record for completion of an 80km event! The races were well attended, with 22 starters in the 160km with 12 finishers. This very high 57% completion rate, in very tropical conditions, was a happy result for all involved in this first running of the Sultan's Cup event.